When you think of skyscrapers, you think of glass and metal but rarely wood. 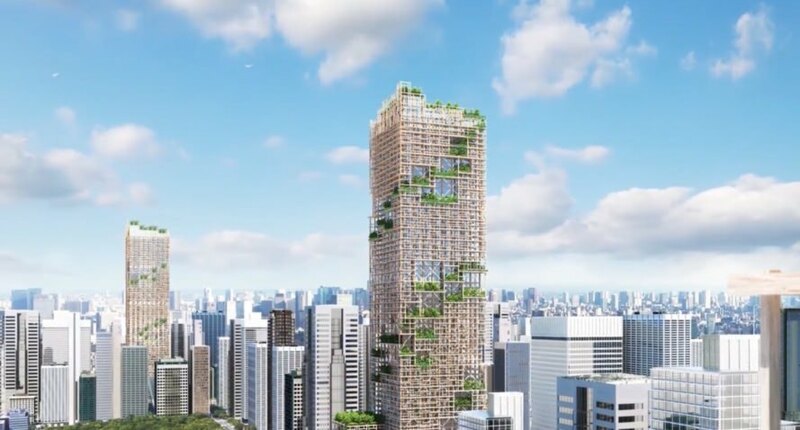 So, it might come as a surprise to learn that the world’s tallest wooden skyscraper is set to be built in Tokyo. We might not think twice at a timber frame construction company erecting a wooden frame for a new home, but a skyscraper? The company behind the plans, Sumitomo Forestry, says that the structure will measure 350m high and constructed of mainly wood and steel, with up to 90% consisting of wood. The structure has been called W350. Around two thirds of Japan is covered in forest, so it’s no surprise that timber abounds for the construction industry. W350 is intended to be 70 storeys high and the plans include space for shops, hotels, private apartments and office space. The ethos of Sumitomo Forestry is that ‘happiness grows from trees’ and their aim is to help create urban areas that utilise timber and focus on environmentally-friendly design. They want to turn cities into forests with the increased use of architecture made with wood. If you’re interested in your own timber home, contact a timber frame construction company like QTF. You might think timber in construction would be cheaper, especially in a heavily forested country, however, using less than 2,000 cubic metres of timber costs twice the amount of more conventional high-rise buildings materials. The company believes that the ongoing use of timber will bring the cost down as it becomes a more accepted and widely use material. The long-term effects of timber also reduce the cost of technological development and provide energy saving benefits. W350 will far surpass the current tallest wooden building in the world. This is the Tall Wooden Building that acts as student accommodation for the students of the University of British Columbia in Vancouver. This structure is only 53m tall. The Sumitomo Company also intend to feature a lot of greenery in the construction, with foliage running from the ground to the top floors. Balconies will run around the whole building, providing people with a fresh, natural environment where the sun can filter through the foliage. All high-rise structures in Japan must be constructed with earthquakes in mind, as these are not unusual in Japan. Therefore, the building will include an inner system of braced tubes consisting of beams, braces and columns to help keep the structure secure in the event of lateral forces like high winds or earthquakes. The risk of fire with timber buildings is another concern, as is wood’s sensitivity to moisture and the possibility of warping. This means that extra efforts and investment will be made into making sure the building is both fire and seismic resistance. The building has been given the name W350 to mark the 350th anniversary of the Sumitomo Forestry company. The company began trading in 1691 and it is believed the skyscraper will be ready by 2041. There is some concern for the future of the Japanese forests however, in that they are not being maintained properly. Large amounts of both cypress and cedar were planted after World War II and these are now ready for harvesting. Many though, are being left unmaintained as replanting is not being completed after harvesting.